Big Pine Creek's headwaters come from the Palisades area of the central Sierra, and its large glacier. The glacier is responsible for adding an intense greenish hue to the already beautiful alpine lakes. A great place to visit, but be forewarned...the trails are steep! 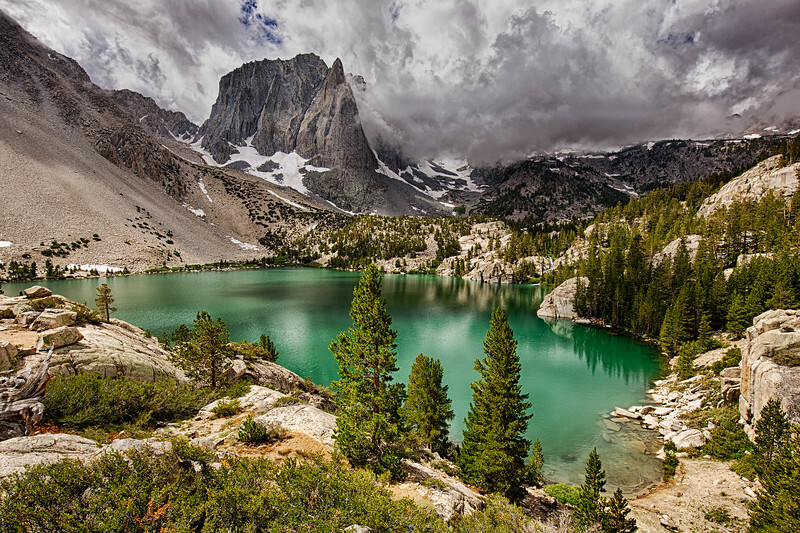 With the granite spires of Temple Crag looming above, Second Lake is a rare gem in the eastern Sierra (it's on the North Fork of Big Pine Creek, near Big Pine, California). The intense greenish color of the water is rare in the Sierra, resembling lakes in the Canadian Rockies and the Swiss Alps. It is caused by rock particles in the water called "glacial flour" carried down from the nearby Palisade Glacier. The color changes throughout the day...it's a very special place in the central high Sierra.